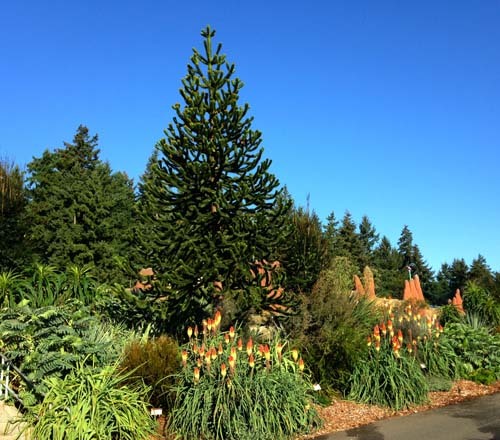 Pacific Horticulture Society | Is it a Zoo or is it a Garden? What happens when a plant collector takes on a zoo? The word “zoo” is short for “zoological gardens,” —historically a place to collect and foster animals. True to that definition, when we think of a zoo, we think of the animals. So how about refreshing that “garden” part? As animal conservation has moved to the forefront of modern zoos, plants are also becoming an integral part of zoo collections across the nation. How a zoo is landscaped becomes an important reminder that plants are the foundation for creating animal habitat. Recently I went to Point Defiance Zoo and Aquarium in Tacoma, Washington, expecting to see the place where I took my children when they were young. Somehow, over the years (and without toddlers to entertain) I missed the transformation of this once-familiar destination. This time, I saw the fauna and the flora. A large agave collection and soft blue Nolina nelsonii greeted me at the entry leading to wide pathways that meandered through lushly planted beds filled with a blend of common and exotic plants. My inner plant nerd was intrigued. 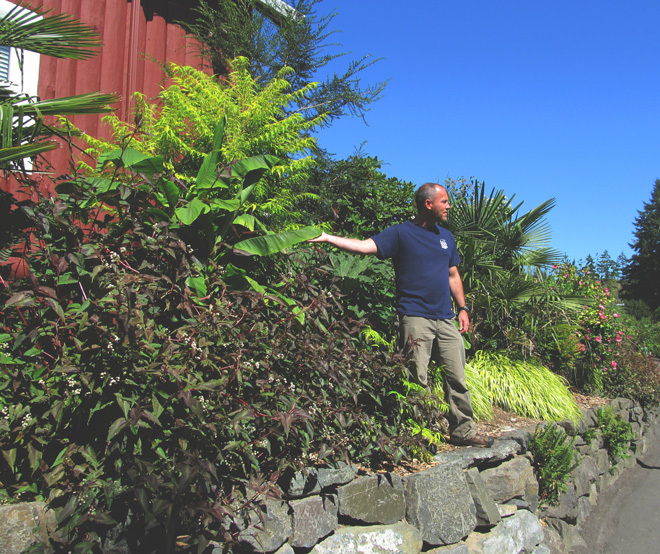 To learn more, I talked with Point Defiance Zoo horticulturist Bryon Jones, a man immersed in zoo culture. 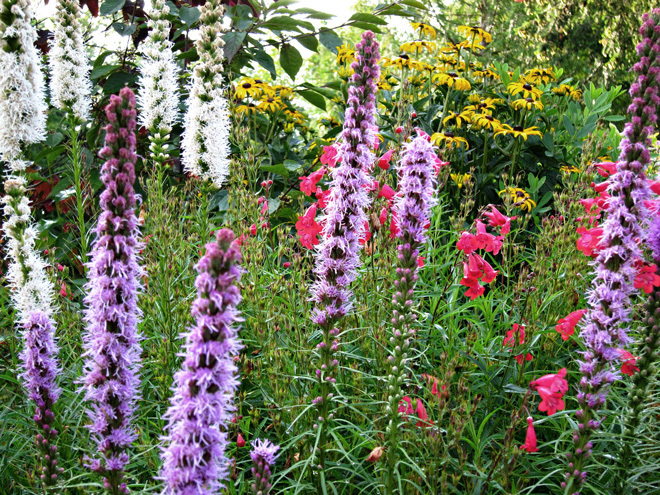 A zoo horticulturist needs to be multi-faceted: part zoologist, part landscape designer. As Bryon talked about his work at the zoo, I couldn’t help but think how lucky he must feel to sneak his plant passion into decisions about what to grow. The collection he curates includes an impressive variety of bamboos, (over 50 species, which recently caught the attention of a national bamboo society), massive meadows filled with Lobelia tupa, fragrant perennials to attract pollinators, and many varieties of trees and shrubs planted throughout the grounds. 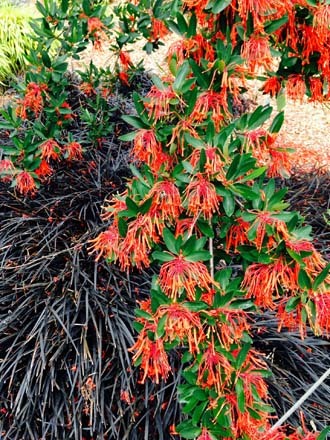 On the day of my visit, the flaming red glory of the Chilean fire tree (Embothrium coccineum) emerging from a bed of black mondo grass (Ophiopogon planiscapus ‘Nigrescens’) was stunning. Bryon is in his element. But this is more than a collector’s garden—it is about an effort to connect animals, plants, and people. This is not just landscaping, this is respecting the animal’s native habitat and re-creating that environment around them. Bryon describes the plants as ambassadors to the stars of the zoo, which are the animals. These lushly planted public spaces enchant and encourage people to slow down, touch, share, and learn. It is a unique opportunity to design gardens that teach people about cultures and habitats from around the world. Plants representing every continent are captured in the zoo displays, from Arctic tundra to an Asian forest sanctuary. The public gardens at the zoo present the perfect platform to share how plants and animals need to coexist. Much like the introduction to a book, plants can be a lure; the tease of fragrance, texture, and color that draws people in. 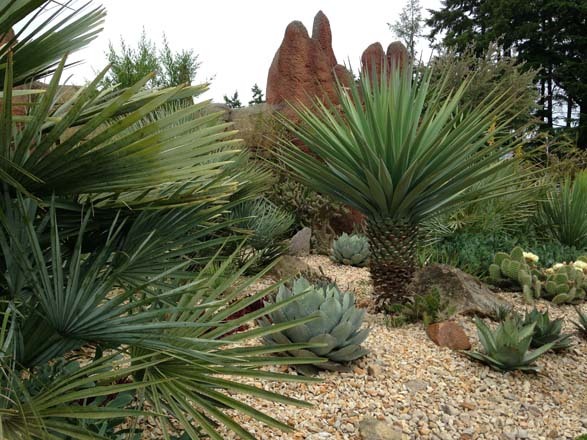 The abundant landscaping at Point Defiance Zoo has many stories to tell. For Bryon, the entry bed at the main gate of the zoo is a personal favorite. It has a desert-like mood with rock-mulched surfaces planted with dozens of cacti, a prized agave collection and six different species of yucca including a flourishing patch of Yucca rostrata. It is a design that tells a story of diversity and survival. 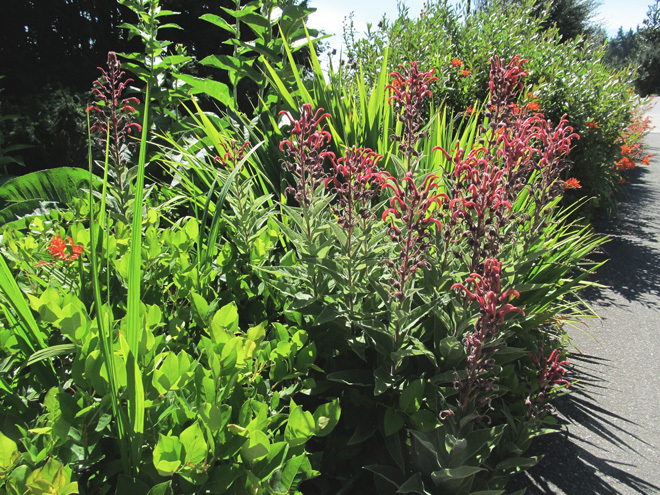 The plants are not typical of this soggy, Pacific Northwest climate. Bryon sees it as a way to teach about the plant’s native environment and demonstrate how to help the plants thrive. Plant displays also instruct visitors about what plants do for animals. It isn’t always about nutrition; plants provide enriching experiences, promote play and curiosity, and encourage behaviors typical to their natural environment. The veterinarians and zookeepers are in charge of making sure the animal’s needs are met, but Bryon coordinates with the keepers in a holistic approach to animal well-being. For example, banana leaves (Musa) were given to the clouded leopard cubs to shred, tear, and play with. Behind-the-scenes collaboration takes place as well. Non-public plantings have been created where zookeepers can harvest blueberries, herbs, and other edibles; last year more than 600 kiwis were harvested as fresh treats for some of the animals. In a symbiotic relationship, the gardens around the animal habitats are putting the “garden” back in “zoological garden.” Visitors feel as if they are walking through a tropical forest surrounding the clouded leopard and tiger exhibits. The rugged habitat in the red wolf display provides a home to these endangered creatures that roam the southeast United States. Visually, the gardens reflect the animals’ habitat but it’s the keen eye of a horticulturist that makes them a real showcase for the zoo.